What a grrrreat job it is to be writer-in-residence for the Pennine Watershed! All sorts of opportunities open up - including the chance to walk across the tops with the BBC's fabby Clare Balding - a real heroine of mine. 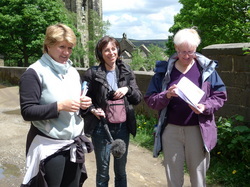 We had a good time exploring the literary aspects of the landscape around Hebden Bridge and Heptonstall. And here you can see me desperately leafing through some of the new Watershed poems I've written recently to find summat that would strike the right note. You can get the podcast here. Or have a listen and see photos from the walk here. As you can see from this photo, we had a completely glorious day for walking... and just after lunch the heavens absolutely opened, so that made it even jammier!